Designed and built by Middle East Engineering , Chase MEE Mobile Grain Bins are developed with strength, versatility and value in mind. The bin capacities range from 18 tonne - 26 tonne. Chase MEE Mobile Grain Bins offer solid construction, use of heavy duty chassis channels and drawbars. In addition, they feature 3mm steel plate panels which deliver a smoother line and less likelihood of corrosion, cracks and rattles. Two compartment bins for seed and super are an option for the Chase MEE Mobile Grain Bins. 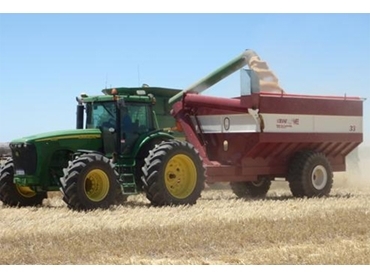 This enables the farmer to utilise the bin for seeding and harvesting. In addition, Tandem Assembly with Rear Axle Steering is an option. The Chase MEE dual axle bin offers the same easy manoeuvrability as the single system but possesses a number of unique benefits, including better weight distribution for large loads resulting in reduced soil compaction and drag.